From procurement of raw materials to advice on fitting the tracks to your machine Sly has you covered with expert advice, knowledge and a vast wealth of experience. Our company is owned by two farmers, so we understand the operating environments, soil conditions, and difficulties farmers face in their daily tasks. 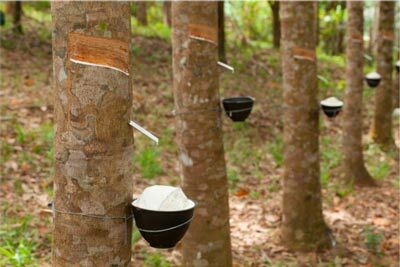 We are not a global rubber conglomerate, but a small/medium farmer owned company focused on producing machines and components to help prevent soil degradation and improve farmers efficiency and productivity. Interested to know what materials go into your tracks? As farmers we thought you might like to read about it! 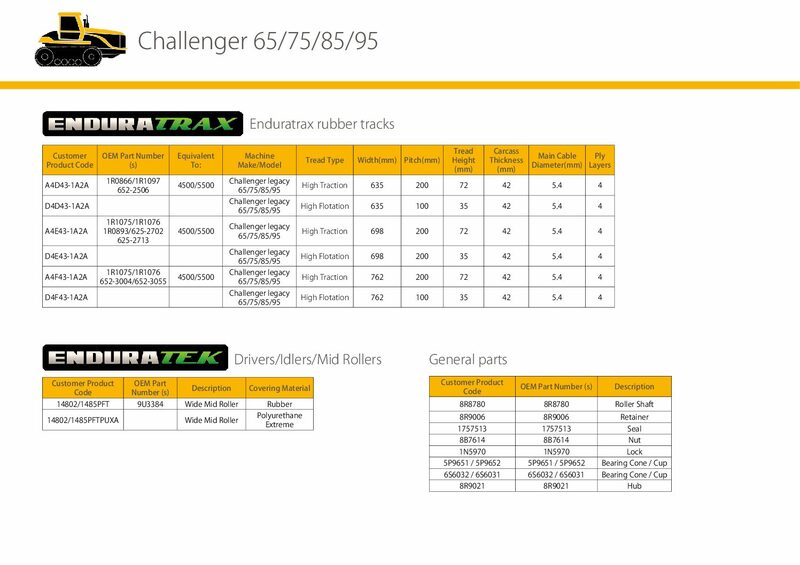 Our tracks are manufactured using a number of formulated rubber compounds which contain both natural rubber (NBR) and synthetic rubber (SBR). Despite huge investment in R+D of synthetic polymers, natural latex still has unmatched qualities when used in tough, off the road environments and that is why it features highly in our compounds. Cover cropping? We are trying our best to support farmers that are growing cover crops in between their rubber trees and in some cases supporting a dairy heard or mixed livestock system in between the rubber trees.This not only reduced the impact of corporate rubber plantations on local areas but improves soil health and brings additional income to the local area. We are the only track manufacturer who donate 25 USD per track sold to Forest Peoples Charity. This provides valuable income to assist the rural communities involved in the production of materials in our products. 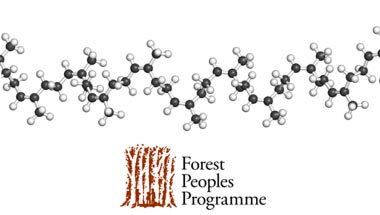 We work to create political space for forest peoples to secure their rights, control their lands and decide their own futures. See www.forestpeoples.org for more information. 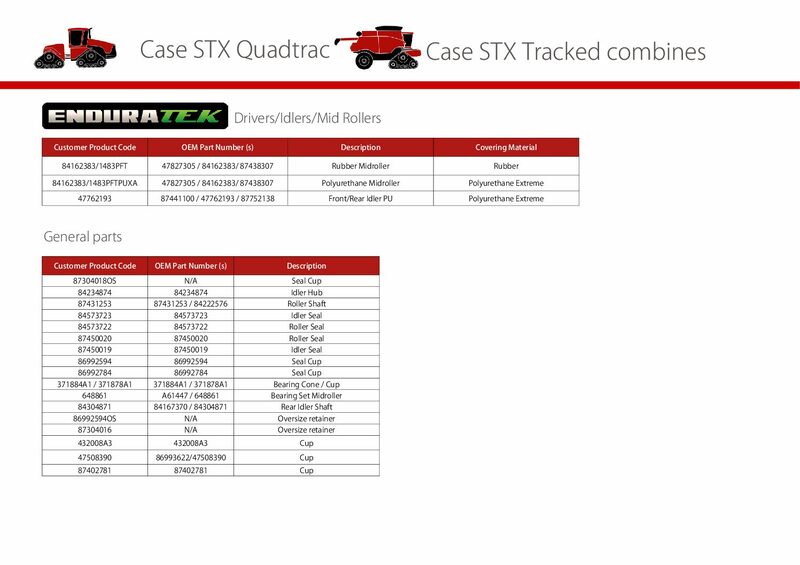 When designing our tracks we carefully factor in the average life of the tread versus the carcass durability. 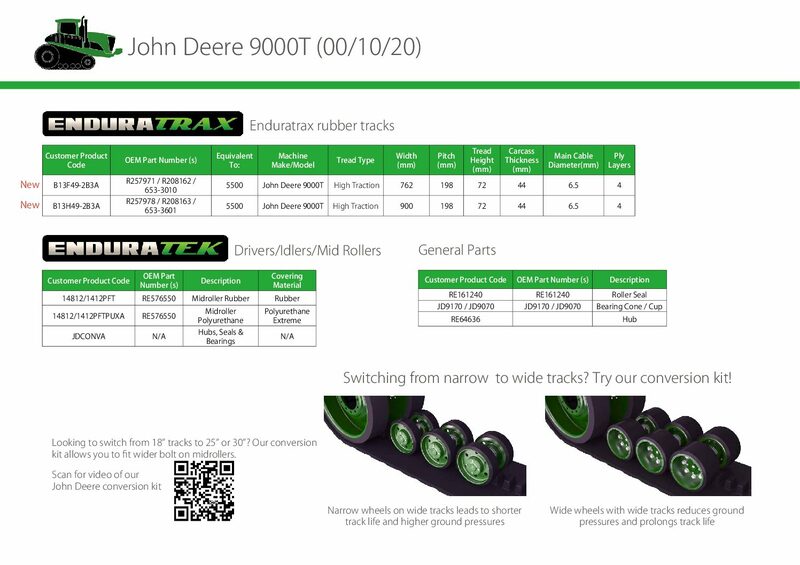 From customer feedback we have learned that the main thing farmers consider when purchasing tracks is the amount of time they will have on the top 60% of the tread height. After the tracks are 60% worn the tread grip and ride comfort reduce exponentially, no matter what brand or style of track. For this reason we have designed our carcass to give the level of durability the customers desire to give an operational cost per hour that is the most competitive on the market. We also maintain a minimum 42mm carcass thickness and a 4 ply structure to optimise ride comfort on all track types. There is no need to over invest on the carcass if you will not see the full benefit and also you should not under invest in the carcass if it will not allow you to realise your tread wear. We are also the only track manufacturer offering a re-tread service for high-roading applications, whereby customers may be able to achieve a 2nd or 3rd life from the carcass and only require the top tread to be replaced. Our guiding blocks offer the maximum density that is permissable to the undercarriage design. Meaning that rather than reduce our cost by increasing the distance between the blocks we install as many as possible to ensure the guiding blocks do not cause the track to become unserviceable. - Our guiding blocks are seamlessly moulded to the inner track carcass. If you regularly use cambered roads or work on side hills, you will only wear our guide blocks down, you will not have guide blocks de-bonding! 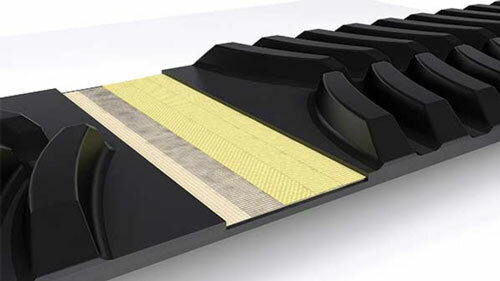 - Competitor guide blocks are not seamlessly moulded but instead "glued" to the track carcass. When roading on cambered roads or on hill sides they will de-bond before wearing through as they fail at the weakest point first. High Flotation: This tread pattern was developed for our IMTS track systems to offer lower ground pressure, maximum surface area and a smooth curved design to minimise disturbance of the soil and to allow work on grassland. 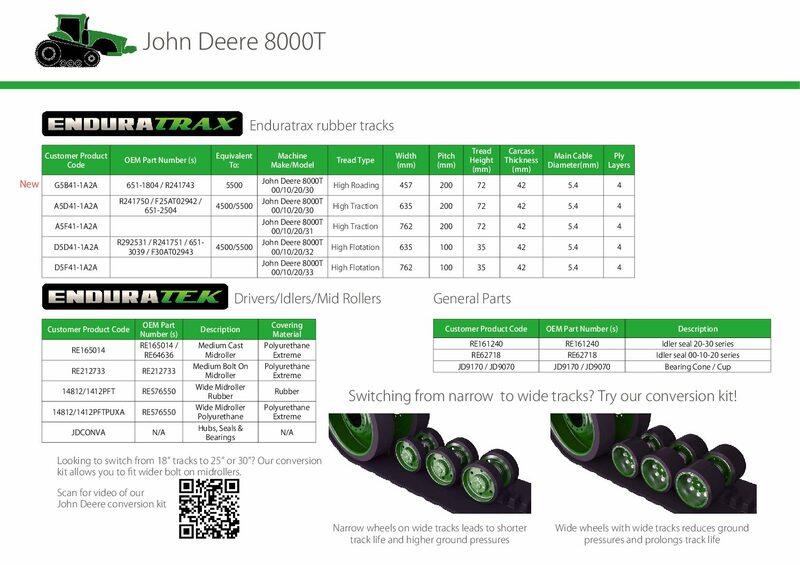 We feature a 35mm tread height and for tractors these tracks are an excellent choice when planting/drilling or working on ground when minimial burming whilst turning is required and draft loads are less. High Traction: Our standard high traction tread utilises an exclusive tread shape and pitch to give you optimum ride comfort, grip and surface area. 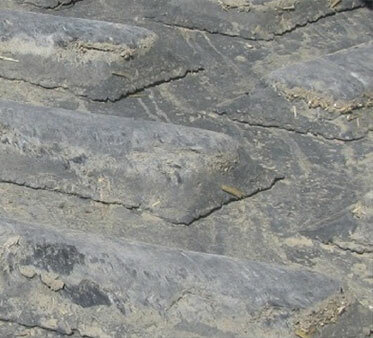 The tread design and height is designed to equally last or exceed the average usable tread % age. 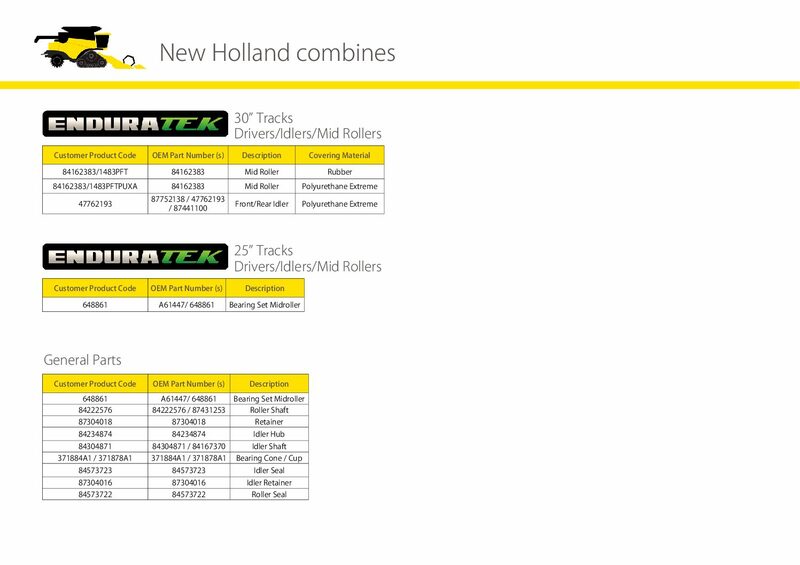 As a general comparison we have 18-32% more tread surface area on our track per metre than our competitors. 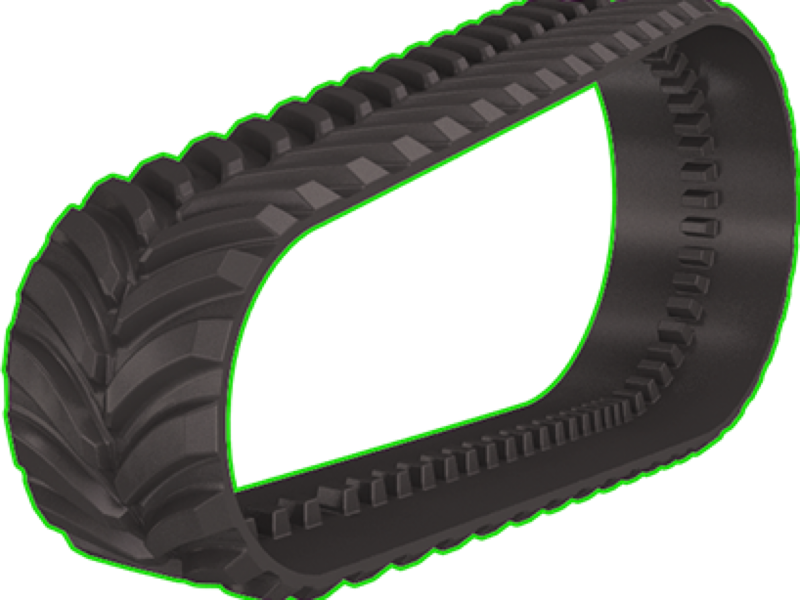 High Roading: Our high roading tread pattern has been designed primarily for harvesting and transport operations. The closer pitch and unique geometry reduces vibration and increases wear life by 20-25% when compared to our high traction track. COMPRESSION MOULDING: Our new tracks are all manufactured by compression moulding, this is the same process used when your tractor tyres are manufactured. Layers of material are processed and laid into position, and then the curing process takes place in between mould plate surfaces to give the final tread and guiding block shape. 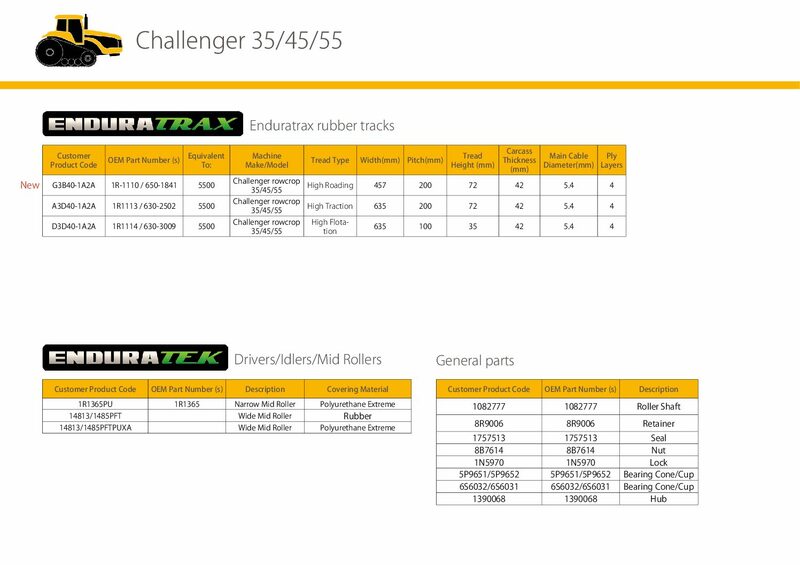 DURABILITY: The durability of compression moulded tracks is as you would expect from a compression moulded tyre. TREAD BAR MOULDING STRENGTH: Our tread bars are cured in one step with the carcass. This gives a molecular bond that is extremely tough. GUIDING BLOCK MOULDING STRENGTH: Compression moulded guide blocks are integrated into the carcass with a molecular bond with almost no risk of de-bonding. CABLE/PLY STRUCTURE INTEGRITY: Some very minor distortion occurs in compression moulding, however this does not reduce the serviceable life of the track. TOOLING/SETUP COSTS: Tooling and setup costs are expensive. 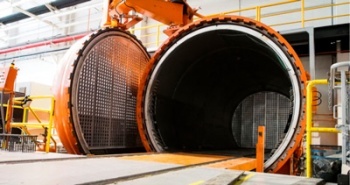 AUTOCLAVE CURING: Our main competitior uses a extrusion process combined with autoclave curing. This process means the carcass is created from layers of material. Then extruded tread and guide block sections are bonded individually to the carcass and then final curing takes place in a pressure chamber. DURABILITY: The durability of tracks made by this process is generally very good. However the nature of the step by step building process means the overall integrity can suffer, particularly on the guiding blocks. TREAD BAR MOULDING STRENGTH: Tread bar moulding strength is very good, however in certain conditions tread bars can break away as the molecular bond is much weaker when compared to compression moulding. GUIDING BLOCK MOULDING STRENGTH: Guiding block bonding is significantly weaker leading to failures on side hills or when travelling for long periods on cambered roads. CABLE/PLY STRUCTURE INTEGRITY:a Very minimal distortion occurs as the curing pressure is much lower. De-lamination can occur if process is not controlled perfectly. TOOLING/SETUP COSTS: Tooling/setup costs are generally lower then compression moulding. BENEFITS OF COMPRESSION MOULDING: Single piece cure means tread and guiding blocks are moulded in a single step ensuring a very strong and durable bond. The ability to offer curved tread designs which improve cleanout ability, ride comfort and grip in wet conditions. Less risk of de-lamination between cable layers. Compression moulding uses extremely high pressures to ensure all layers in the track form a single cured member. 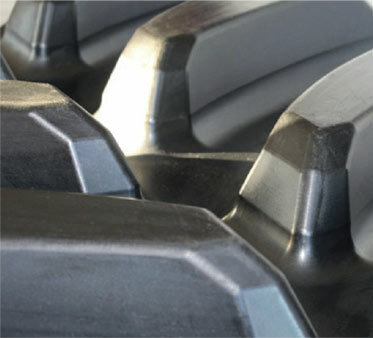 DRAWBACK OF COMPRESSION MOULDING: Expensive to setup, tooling investments higher. Manufacturing process difficult to control, process control must be perfect to maintain cable ply spacing, flatness and to eliminate distortion. More difficult to move to mass production. BENEFITS OF AUTOCLAVE CURING: The benefit of this method is that it is very flexible in track width, length and pitch for the manufacturer. It also has reduced tooling investments and is easier to move into a mass production system. The carcass structure features minimal distortion due to a uniform cure. Vibration, ride quality and cleanout often suffers due to the restrictions in the process. Our guiding blocks offer the maximum density that is permissable to the undercarriage design. Meaning that rather than reduce our cost by increasing the distance between the blocks we install as many as possible to ensure the guiding blocks of do not cause the track to become unserviceable. 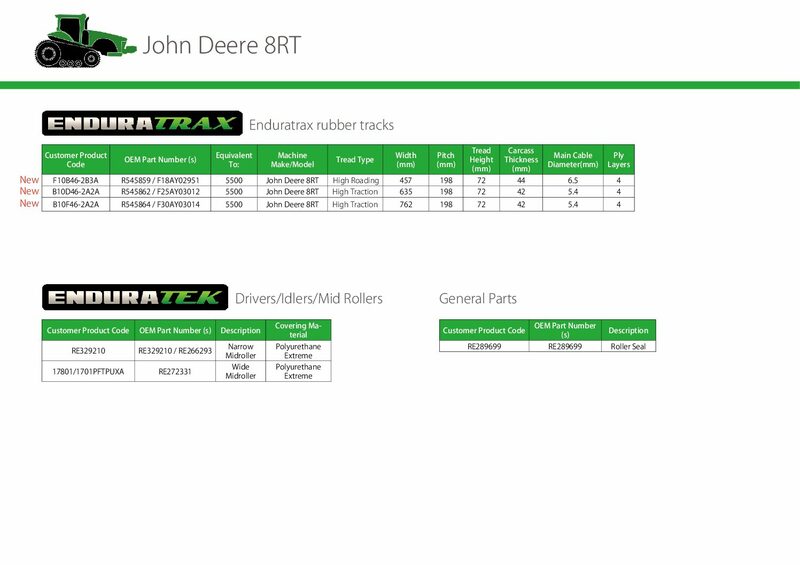 DURABILITY: Our Endura Re-trax remanufactured tracks are designed to last as long as new tracks. The process we use means we don’t overcure the original carcass or affect the integrity of the ply structure & main cables. TREAD BAR MOULDING STRENGTH: Our Re-trax use a compression moulded tread bar that is the cured to the original carcass using a special autoclave curing method. 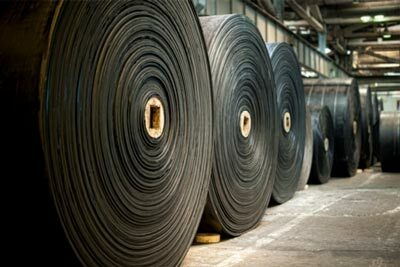 GUIDING BLOCK MOULDING STRENGTH: We regularly see autoclave cured tracks that have more than 50% tread remaining but the guiding blocks have broken away from the main carcass. We can replace these with a compression moulded equivalent which will exceed the life of the existing design. CABLE/PLY STRUCTURE INTEGRITY: Our Endura Re-trax The cable/ply structure is not affected by our re-manufacturing process and so it is maintained. We do inspect the ply layers thoroughly as part of the acceptance process to ensure long term reliability can be achieved. 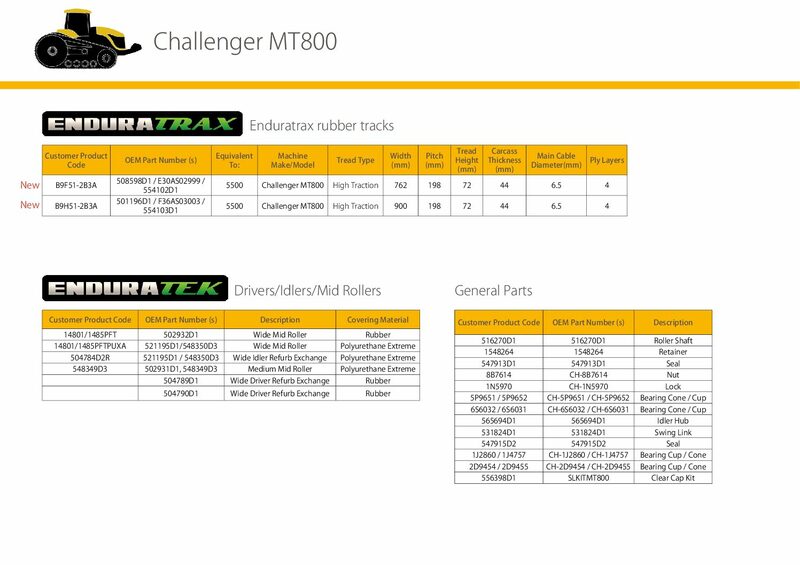 • Track carcass technology is now significantly outlasting the serviceable life of the tread. • Overall operating cost per hour is reduced by up to 45%. 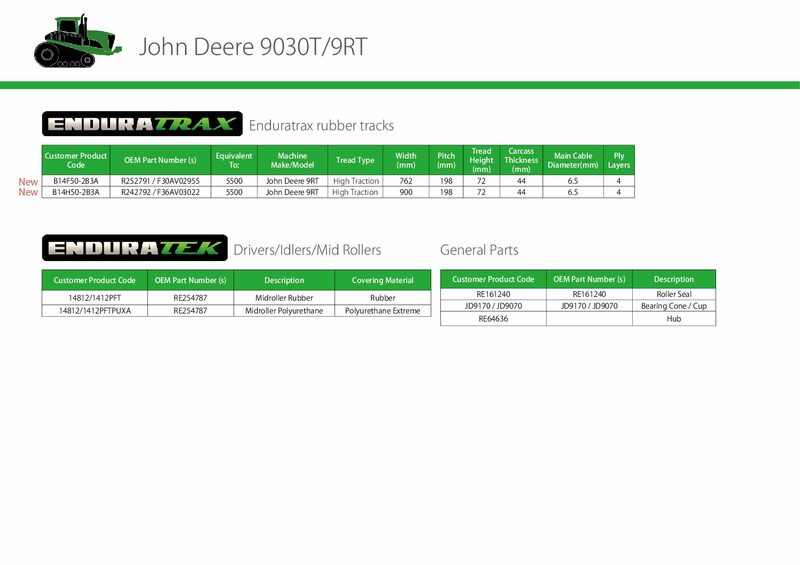 • Keep your tracks operating with +50% tread ensures you can keep working in an ever more volatile climate. • We give the same warranty as new, we can do this because we only select the right carcass to re-tread. • We have an innovative logistics solution to ensure re-treading is feasible and time efficient. Sly has formed and exclusive agreement with Rosler Tyre Innovators in Dortmund, Germany. 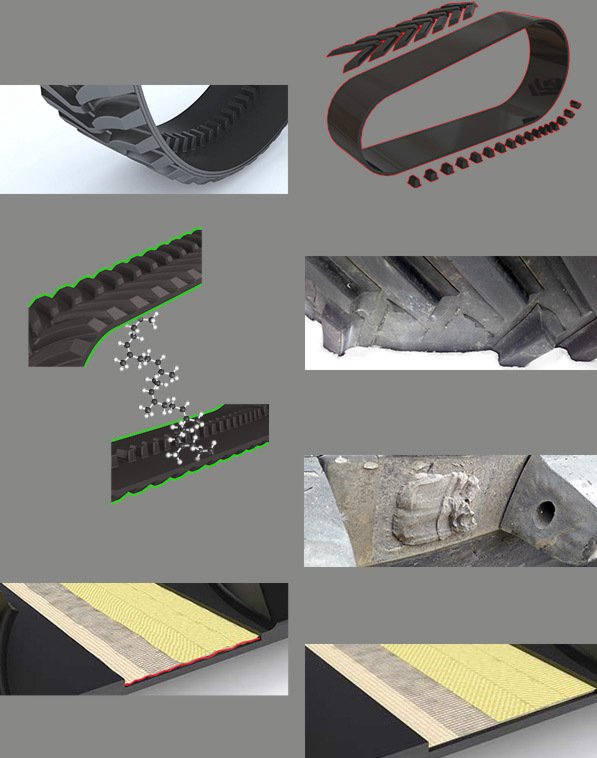 Sly first started to work with Rosler back in 2009 and they have been working together on track re-tread processes and technologyfor 6 years. that operate in the toughest of conditions. This superior background and engineering knowledge, combined with state of the art production facilities means re-treading tracks is now a possibility in Europe. 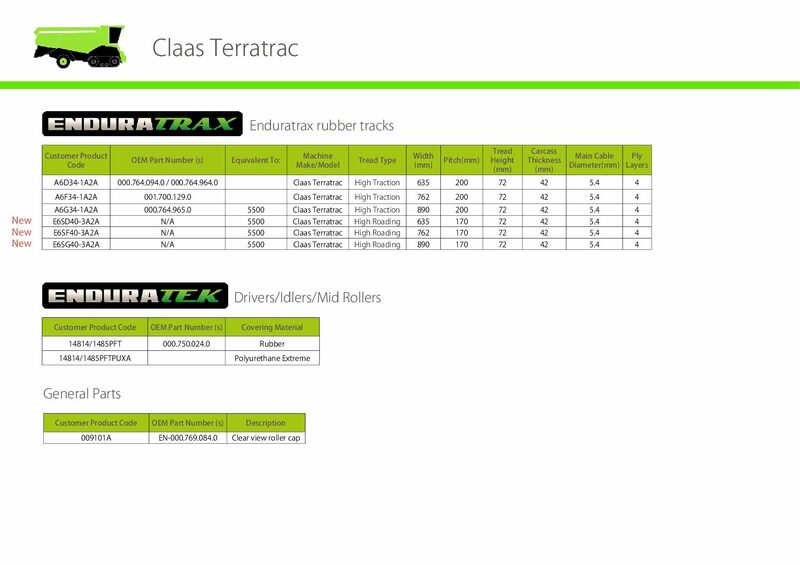 We offer the same warranty as new with our re-treads, each track is meticulously checked prior to acceptance! All our tracks feature a 4 ply structure. But what does this mean? The ply structure in the track is used to give dimensional stability as well as a barrier to cutting/tearing and impacts from foreign objects. The angled plies provide stability across the track and give support in the opposite axis to the direction of travel, which is very important when the load and tension on the track is not only on one axis. The 4th ply which features on all of our tracks but only some of our competitors is a lateral ply placed on the inner roller path side. This provides more protection from cutting/tearing/stone damage but also gives additional support for heavier machines, which is needed to prevent tearing of the carcass. The main cables are the heart of the track and they are helically wound continuous cables which give the tensional strength to the track. You will find there are many different diameters available on the market. 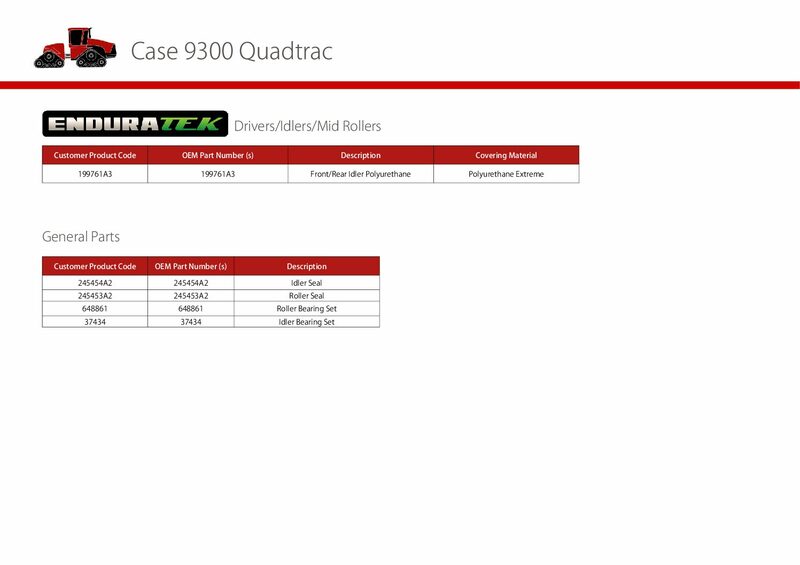 The diameter you require is directly related to the torque that will be transmitted through the track. The larger the torque and weight of tractor/machine the larger the cable required. Our tracks feature either 5.4mm or 6.5mm main cables depending on application. Diameter alone is not the deciding factor. There is no need to purchase larger cables than the machine requires, as this can have a negative effect on power and fuel consumption of your machine, which increases your cost per hour. Our manufacturing joint venture facility is located in China. We like to be open and honest about where our products are manufactured. From the most advanced vacuum cleaner to the world’s most popular smart phone many of today’s products are designed and prototyped in the USA and UK but contract manufactured in Asia. Sly has invested heavily in the same controls, procedures and LEAN production methods as used by other major global manufacturers. This comes at a large expense but it ensures the quality of our product. WHAT MAKES US DIFFERENT TO ANYONE ELSE? 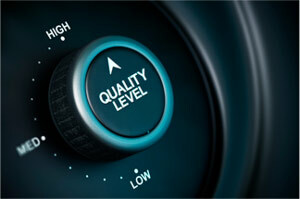 We carefully select raw materials for our products and verify the sources to ensure continuity of quality and supply. This combined with both in house and independent auditing allows us to offer our customers a repeatable supply and repeatable quality. 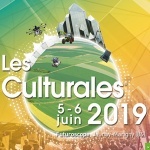 Our own manufacturing facility in France for our cultivation equipment has taught us that quality, repeatability and reliability should be at the helm of everything we do. 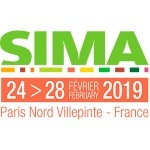 We are also fully aware that innovation and continual improvement are the only way such a small company as Sly can compete with the large industrial conglomerates in the market place. 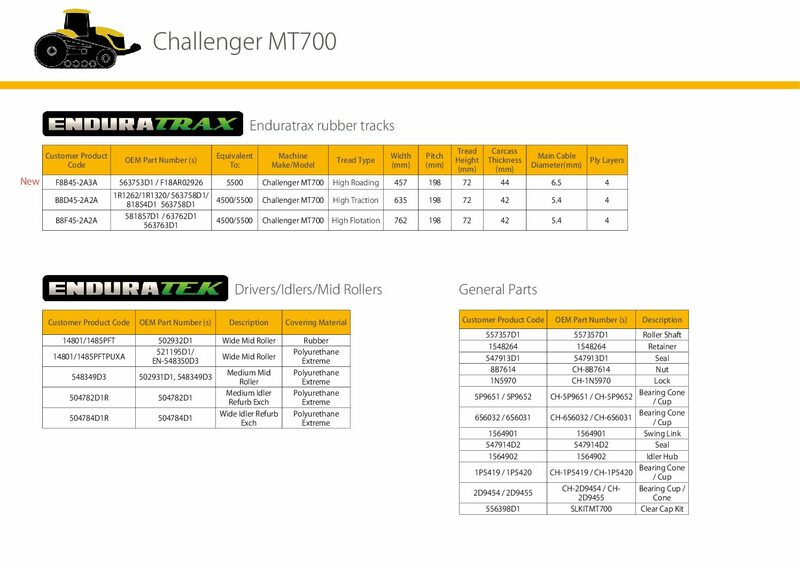 Our warranty on our Enduratrax product line is comparable to all the major industrial players. 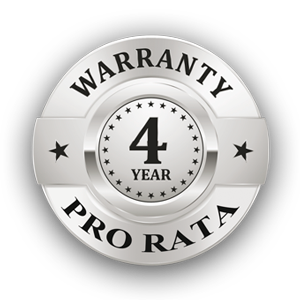 4 year pro rata warranty. We give a fair and accurate policy based on tread wear versus time. This means that over the 4 years we cover your tracks, the amount of money you could get back from a claim decreases as you wear the tread. If our track become unserviceable in the 4 year period, we honour our policy! All we ask is that when you consider your purchase you ask to see the warranty policy, this way you are sure you are getting what you ask for. Of course we design our products in such a way that you should never need to use the warranty policy and it is only a re-assurance at the time of purchase. Please refer to our warranty policy for more information. 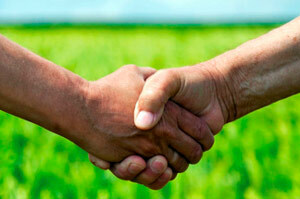 Farmers work hard so that 7 billion others can live there life without the worry of food security. As farmers ourselves we do everything we can to support you.